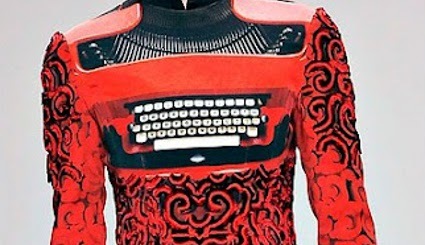 Here’s my “Freaky Friday Fashion” pic for the week, a typewriter dress by London designer Mary Katrantzou. I’ve been searching for something to wear to my next blogger convention that will stand out, and this is perfect! I’m sure I’ll get plenty of press attention and social media comments in this frock. It’s just my type.